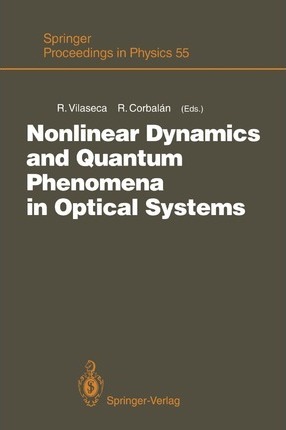 This volume contains contributions based on the lectures delivered at the Third In- ternational Workshop on Nonlinear Dynamics and Quantum Phenomena in Opti- cal Systems, which was held in Blanes, Girona, Spain, 1-3 October 1990. Blanes is a charming small town located on the well-known Costa Brava. With the con- venient facilities of the Centre for Advanced Studies (CEAB), Blanes followed of the previous meetings of this series, which were held at Palma the tradition de Mallorca and Santander. We aimed to provide an opportunity for scientists active in the broad field of quantum optics to meet in an informal atmosphere, thus promoting the ex- change of ideas and allowing a search for interconnections between seemingly unrelated topics and a cross fertilization of the different subfields of quantum optics. We encouraged contributions dealing with the newest and most important developments in quantum optics. The main topics included instabilities, chaos, spatiotemporal dynamics, and pattern formation in lasers and nonlinear optical devices; phase dynamics; generation and detection of squeezed and other non- classical states of light; coherent interaction of light with atomic systems; and multiphoton processes and above-threshold ionization. The meeting brought together a group of 72 optical scientists from Belgium, France, Germany, Israel, Italy, Spain, the United Kingdom, USA, and USSR. In the technical program, nine invited papers were included, presented by eight distinguished specialists. Illustrations note X, 327 p.
I Squeezed and Nonclassical Light.- Discrete-Mode Theory of Quantum-Optical Processing.- Continuous-Mode Theory of Quantum-Optical Processing.- Generation of Squeezed Light.- Optical Switching Induced by the Variation of the Squeezing Phase.- Intensity Squeezing in Lasers with Two-Photon Saturable Absorbers.- Quantum Corrections to the Berry Phase for the SO(2,1) Dynamically Invariant Parametric Oscillator.- Nonclassical States of Light and Canonical Transformations.- Langevin Equations for Squeezing by Means of Non-linear Optical Devices.- II Processes in Very Strong Fields.- Atomic Physics and Nonlinear Optics in Very Strong Laser Fields.- Multiphoton Absorption Induced by Chaotic Phenomena.- Coherence and Interference in Multiphoton Processes.- III Basic Quantum Phenomena.- Amplification, Lasing and Inversion.- Trapping in Some Model Hamiltonians.- Optical Bistability in a Ridge Waveguide Resonator Including a Multiple Quantum Well.- Squeezing Behaviour of a Degenerate Paramp with Fourth-Order Interaction: Stationary and Transient Statistics.- Completely Integrable Systems in Nonlinear Optics of Elliptic Gaussian Beams.- Nonlinearities in Polar Molecules: Optical Bistability and Phase-Conjugation.- Phase Space Methods in Quantum Optics: Quantization Maps in the (q,p) Representation.- IV Nonlinear Dynamics.- Chaos and Pulsating Instabilities in Stimulated Brillouin Scattering.- Optical Chaos in a Laser Diode Pumped Nd Doped Fibre Laser.- Amplitude and Phase Dynamics in a Four-Level Model of a Coherently Pumped Laser.- Linear Stability Analysis of a Resonant Cascade Laser.- Phase Anholonomy and Quasiperiodicity in Optical Systems with Intensity Pulsations.- Local and Global Bifurcations in Opto-thermal Bistability with Localized Absorption.- Induced Superradiance and Dynamical Chaos in a Thin Film of Two-Level Atoms.- Analysis of a Modulated LIS Model.- Role of the Earth's Magnetic Field and Atomic Coupling in Polarization Instabilities in Quasi-Isotropic Lasers.- Ultrashort Pulse Dynamics in Nonlinear Couplers.- Deterministic Phase Diffusion, Dimensions and Entropies of Chaotic Lasing in the He-Ne Ring Laser Gyro.- V Transverse Effects.- Transverse Pattern Formation in Lasers.- Principles of Transverse Pattern Formation in Lasers.- Phase Singularity Crystals in Transverse Laser Patterns.- Order-Disorder Transition in the Local Dynamics of a TEA CO2 Laser.- VI Influence of Noise.- Noise and Transient Dynamics in Semiconductor Lasers.- Relation Between Passage Time and Maximum Intensity in Semiconductor Laser Gain Switching.- Transition from Deterministic to Stochastic Behaviour in Bistable Systems.- Phase and Amplitude Correlations Induced by the Switch-On Chirp of a Detuned Laser.- Noise and Symmetry Restoring in Transverse Laser Patterns.- Analysis of the Decay of Intensity Correlation Functions for the Gain-Noise Model of Dye Lasers.- Anomalous Fluctuations for a Good Cavity Laser with Swept Losses.- Detection of Weak Optical Signals in a Laser.- Index of Contributors.